Darian MacKinnon lay beside the away end at New Douglas Park, his damaged knee erupting with pain and the taunts of the travelling supporters cascading down upon him. The agony from his knee, MacKinnon could handle. The flak, he was long used to. But when, on that afternoon last January, he heard supporters baying for an end to his livelihood, he saw red. MacKinnon is a fearsome competitor. He's done time in a young offenders institution and now captains the Scottish Premiership's great survivors. It is his job to scrap for every morsel, to be a colossal nuisance to the opposition. That is how he has to be on the pitch, but it is neither who he is nor how he lives his life away from football. "Those fans don't know me as a person. They see a guy in 90 minutes," he says. "A Dundee fan actually phoned the club to apologise when he read about it in the paper. I get it, I've been a fan myself and you get caught up in the game, but keep your head and don't shout stupid things. "See when I'm out on the pitch, I'm not going to like anybody, I'm going to be an animal, whatever I need to be to win a game. Off the pitch, we're totally different people." MacKinnon tells a story about Dundee rival Martin Woods, a man who held a blunt and withering view of his opponent and the way he went about his game. "Then I met him one day," says MacKinnon. "He's best pals with [Hamilton defender] Matt Kilgallon. He said to big Killer, 'what a guy that boy is'." MacKinnon's tale is uplifting. A boy from the wrong side of the tracks who veered perilously close to a very different life. At 16, he was charged with assault. At 18, he was sentenced to four-and-a-half years behind bars. He served two years and seven months of that stretch in a young offenders institution. Family and football were his salvation. At 26, he was helping his friends on building sites and excelling in the junior game, yearning for a crack at senior football but never really sure if one would present itself. "I made a couple of crazy decisions. I was just unlucky I was the one that got caught, if you like. I took my medicine and moved on," he says. "I had my kid not long after it, and you don't want to let down your family. I've never been in trouble before and I never will again, touch wood. "Football was massive because that's all I did in there. It keeps you going. I got on well with the people in the PE department there, so any time they needed an extra body, I was out playing. "When I got back out, I just put myself right back into it and it started to take off." In 2012, Hamilton gave him his break. It was an exhilarating prospect - a contract at a club in Scotland's second tier with serious designs on the top flight and in Alex Neil a young manager going places fast. Still, the pro life took some getting used to. There were adjustments to be made and almighty rollicking from Neil when MacKinnon, quite innocently, answered a plea from his builder pal. "The day before pre-season, my friend phoned me saying he was short of a body and needed help. Nae bother. I came out and did it, lifting, digging, putting brickwork down," he says. "The next day, we were doing agility testing. I went to bend down, hurt my back, went 'aargh!' and fell. Alex Neil asked what was up with me. 'Gaffer, I was out lifting bricks and helping my mate yesterday'. "He's looking at me like, what the eff…'don't you ever do that again!'. All the other boys were howling. He laughed about it later but he was like, 'what is wrong with you? You're no' right in the heid'." Being "no' right in the heid" is a tag that has stuck with MacKinnon, even now at the age of 33 and having signed a two-year contract extension last month. His new manager, Brian Rice, says MacKinnon "does some brilliant things and some stupid things" and is trying to encourage his captain to stop "running about all over the place and blowing up". But treading the path he has gives MacKinnon a keen insight into the influences that can warp young footballers. 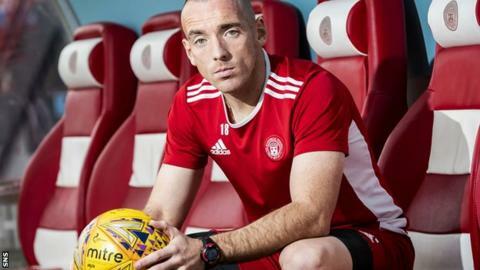 He and Dougie Imrie - another Hamilton stalwart - coach the club's under-16s and are working to mould the next James McArthur, Lewis Ferguson, Greg Docherty or Eamonn Brophy.